Roadside America for South Dakota for those unusal sites to see. We entered South Dakota from Wyoming on I90 after visiting Devils Tower in Wyoming. We wanted to spend the night in Keystone and watch the lighting of Mount Rushmore National Memorial(state site) that night. For the National Park Service Mount Rushmore NM site click here. We traveled I90 East through Spearfish and Sturgis on I90. We then entered the Black Hills by following US14A through Bolder Canyon into Deadwood, Central City, Lead and Pluma. In Pluma, we turned on to the Black Hills Parkway (US385) to travel the heart of the Black Hills. This route gave us views of the thick dark forests, vistas of the mountains made of rocks and short takes of a few of the lakes here in the hills. We got into Keystone with enough time to find a place to stay and walk around the western style main street. We had dinner at the saloon in town. It was a fun experience with all the staff in 1890's clothes. Service was good and the bar-b-que buffalo mighty fine! That night we went to Mount Rushmore NM and watched as the presidents were illuminated. Quite a site! Especially since we had not yet seen the monument in the daylight. The granet glowed in white showing the faces of U.S. presidents Washington, Jefferson, Roosevelt and Lincoln surrounded by the black of night. Unfortunately, our photos do not do justice to this sight. You'll have to visit. We decided to spend the day being a tourist through the Black Hills (RnRnow site with our pictures). Even spending the equivalent of two days, we didn't see and do anywhere near 'all' there is to see and do. The day started with breakfast at 1880 Railhead Family Restaurant. We took ST 244 up to Mount Rushmore. They have been doing a lot of building in the area and now have have several visitor/information centers with a covered parking garage. A far cry from when they just had a parking lot and a trail to Gutxon Borglum's studio (the artists work area with the models). While the consturction is starting to look more like the monuments in Washington DC (marble walls and concrete walks), it is well designed. The design provides wonderful views and educational opportunities while protecting the area from the two and a half million visitors this place gets every year. If it was left to paved and dirt walks, the place would look trashy. Congradulations to everyone involved! The monument itself is majestic! Fourteen years of work for all to reverently enjoy. We then left for the Crazy Horse Memorial by turning right on ST244 and south on the Black Hills Parkway (US385/US16). The Black Hills Parkway passes directly in front of the Crazy Horse Memorial, only 17 miles away. We spent a great deal more time here than expected, but it was worth it. Learning why the Indians choose Crazy Horse, hearing how the progress has been through the years, seeing the displays in the Indian Museum of North America, viewing Ziolkowski's (the artist) studio-home and other art works, watching demonstrations of traditional dance, eating lunch, looking at the model and monument, and picking a few rocks to take home from the monument (with permission), all takes time. While we had heard of this effort, we knew very little. The project has been in progress for 50 years. The first 40 years roughed out the general form on the 600 foot mountain. In the last 10 years, the 9 story face has started to take shape. The project includes the monument, the surrounding development and a foundation aimed at providing educational opportunities for Native Americans. The foundation goal is to develop a Native American college on the mounument grounds. While the college is a ways away, the foundation has already asssisted more than 1,000 Indian students with college scholarships and opened a Native American Education & Cultural Center on the grounds. This experience for my family was worth the trip! With the proximity to Mount Rushmore, comparisons must be expected. The presidents have 6 story faces, little more than portraits(less than planned), are carved into the mountain, were government funded, were made primarily to attract tourists and work ended when the artist died and government funds ended. Crazy Horse has a 9 story face, will include the upper torso and horse, is being carved "in the round" like a statue, are privately funded through donations and fees, and has a long term beneficial goal to society. The work also continues, directed by Ruth Ziolkowski and the Ziolkowski family, even after Korczak Ziolkowski died in 1982. We ran out of time, since we had a train to catch. Hopefully we will make another trip to the monument to see the head finished. Running low on gas, we decided to continue to Custer even though we needed to get back to Keystone to ride the last round trip of the 1880 train for the day. We had to drop the idea of visiting Jewel Cave National Monument, the National Museum of Woodcarving, the Mamoth site, Wind Cave National Park and Hot Springs. For the return trip to Keystone, we took US16A east through Custer State Park and over the Iron Mountain Road. Custer State Park has a lot of unique rock formations, but is better known as a wildlife refuge. 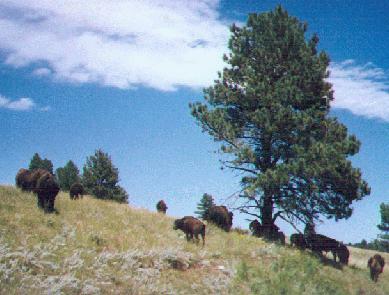 They have nearly 1,600 buffalo roaming free (the picture above is from this park), wild burros, Rocky Mountian Bighorn Sheep and a lot of prairie dogs. This leg of the trip included waiting for the buffalo(twice) and burros(once) to move off of the road. Going down the Iron Mountain Road into Keystone, the road goes over several pigtail bridges where you cross under the bridge you just went over. It also passes through three tunnels, the last of which aimes directly at Mount Rushmore. The opening basically frames Mount Rushmore, so watch out for people standing in the road taking pictures! Needless to say, we missed the train in Keystone, so we drove to Hill City to catch the last round trip from there. As it turned out, this gave us time to look through the 1880 train gift shop, see Hill City and take a few pictures of the train arriving. After the train ride, we returned to Keystone for a swim, dinner and the night. Time to start the long haul home. Before breakfast, we left Keystone on US 16A and then US16 into Rapid City. As we reached the edge of the Black Hills and decended into the plains, we could see storm clouds to the South and in front of us. We moved along I90 east watching the storm clouds moving in. Our next destination was Wall, South Dakota where a pharmasist was able to keep his drug store open during the depression by giving away water! Wall and Wall Drug are now a major attraction. Just like Ruby Falls (Tennessee) and South of the Boarder (Carolinas), you see Wall Drug signs all over. When you enter Wall Drug, remember to pick up a map (you need it for this store). We had breakfast and then toured the new back section where they have a lot of pictures taken through the years. They also have an animated dinosaur which initially scared the girls. We drank the water, played on some of their attractions, let the girls stretch their car legs, and bought a few things before getting back in the car. Next, a drive through the Badlands(RnRnow site with our pictures) or Badlands National Park (NPS site). We followed the rain through the badlands, so the ground was wet whenever we stopped. Not bad for us, but a real mess for those soles on motorcycles. We passed by Interior and came out at Catus Flat and went back onto Interstate 90 heading east. Following I90 across South Dakota, we passed Kadoka, Belvidere, and Murdo before we had to change our watches. We then continued by Vivian, Presho, Kennebec and decended into Chamberlain and Oacoma to cross the Missouri River. We enjoyed the green trees after the dry plains, stopped to eat lunch and then continued on I90 east past Kimball and Plankinton. When we reached Mitchell, both girls were asleep, so we didn't stop. Mitchell is home to the Corn Palace, the Worlds Largest Balloon and Airship Museum and the Enchanted Doll Museum (among other attractions). Again, something for the next time through. Before reaching Sioux Falls, we stopped at a tourist information station to get directions to a great new Mexican Restaurant which just opened in Sioux Falls -- Inca Restaurant at 3312 South Holly Ave. They have other resturants in Washington State, and we wanted to visit this one. It was easy to find. Just take I29 South to exit 77, take 41st east across the river and look for South Holly Avenue on the left. We got there about 4:30 and a good thing since we didn't have reservations. This place has become one of THE places to eat in Sioux Falls. We were just going to have a snack, but decided on dinner. Best Mexican food I have had since moving east (15+ years?). Great service and the kids had fun with the owners. Good Luck guys! We left South Dakota and entered Minnesota on I90 heading east.